After just three weeks in office, Secretary of State Mike Pompeo on Thursday distanced himself from some cuts in the Trump administration’s proposed $39 billion budget for the department in fiscal 2019, telling senators “we’re going to get the resources we need” when fiscal 2020 comes around. In a Foreign Relations Committee hearing dominated by President Trump’s surprise cancellation of the June 12 summit with the leader of North Korea, Pompeo provided written testimony that stressed “our obligation to use taxpayer dollars wisely and effectively” while pressuring other nations to step up their financial contributions. But ranking member Robert Menendez, D-N.J., told Pompeo the administration’s budget proposal is “stunningly irresponsible” and “runs counter to what you said in your confirmation hearing.” Though the secretary had “inherited plummeting morale and a hollowed-out” career diplomatic staff, Menendez commended him for lifting the hiring freeze, even though some bureaus are still not hiring, the senator said. “Our bureaus still have a little guidance to issue,” Pompeo said, acknowledging “a big gap at the associate secretary level and the undersecretary level.” But his team has created “end-strength goals” in hiring, and “where demand says we need additional talent,” employees at State are being empowered. 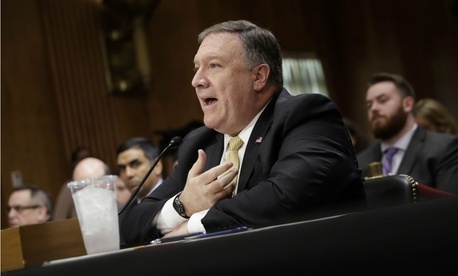 Pompeo highlighted a $20 million increase, totaling $55.4 million requested, for the Global Engagement Center set up in March 2016 to counter extremists’ propaganda and disinformation. “We will not tolerate Russian interference in the 2018 elections, and we must take countermeasures in response,” he said. Many senators were critical of Trump and Pompeo’s handling of the widely publicized but apparently dead summit aimed at denuclearizing the Korean Peninsula. But the most sparks flew when Sen. Tom Udall, D-N.M., picked up the discussion of Trump’s recent zigzags on U.S. sanctions on the Chinese telecommunications firm ZTE, considered a security threat until Trump suggested easing up to help the company protect its jobs. “Given that he hasn’t released his tax returns, how can you assure the American public that his foreign policy is free of his personal conflicts of interest?” Udall asked.